Itchmo: News For Dogs & Cats » Blog Archive » Happy Mother’s Day! 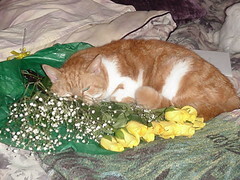 Here are some flowers that I got for you, but then I sat on them, so they may be kind of smushed. This entry was posted on Sunday, May 13th, 2007 at 3:55 am	and is filed under Cats, National Dog, Cat & Pet Info, Art & Pictures of Cats & Dogs. You can follow any responses to this entry through the RSS 2.0 feed. Both comments and pings are currently closed. I lost my sense of humor the week of March 16. God Bless and Happy Mothers Day! Could not help but get some wonderful smells for myself too! God Bless and Happy Mothers Day! Figured I would catch some of the Happy Smells too!! Happy Mom’s Day All! There are an Awful lot of Lucky Furbabes Here! These flowers were for me, right? Hey, they were on my bed. The reason our food safety has been gutted is simple. The Trade Act of 2002 (FAST TRACK) (Pub.L. 107-210; 116 Stat. 933; 19 U.S.C. Â§ 3803-3805; also called the U.S. Trade Promotion Authority Act) grants the President of the United States the authority to negotiate trade deals with other countries and gives Congress the approval to only vote up or down on the agreement, not to amend it. Unless extended by Congress, trade promotion authority will expire in July 2007. Permanent Normal Trade Relations (PNTR) was signed into law on May 24, 2000 (H.R. 4444). The granting of Permanent Normal Trading Relations with China allowed for unconditional, unlimited, permanent access for Chinese-made goods into the U.S. market and an end to the annual review of Chinaâ€™s trade status. The annual review granted China â€œMost Favored Nationâ€ status, and drew attention to human rights abuses by requiring a new discussion each year. In addition, this new status paved the way for Chinaâ€™s entry into the WTO. oh look. a comment totally irrelevant to the topic of the thread. Anyway, here’s my caption submission…. These flowers are for my mommy. I am using my face as a thorn cushion so she won’t get hurt. Not to rain on anyone’s parade, but baby’s breath plants are poisonous to cats if ingested!Be careful!!! This is just too sweet. Love it.